In association with the famous brand Caron, Livia & Yassem have revisited a spray of sequins and preciosity, with flaches of crystal, nacre and magical stuff. The spirit of the designers of On Aura Tout Vu redesigns our daily life, showing us new facets, giving it sparkle, and offering it back to us shiny precious and rafinated. In 1910 while the elegant women, who adore Caron perfume from all over Europe, do not hesitate to travel to Paris, buying their bottle. Ernest Daltroff developed a wonderful fragrance called “ISADORA” in honour of Isadora Duncan, infamous dancer in the 10’s, early Art Deco era. 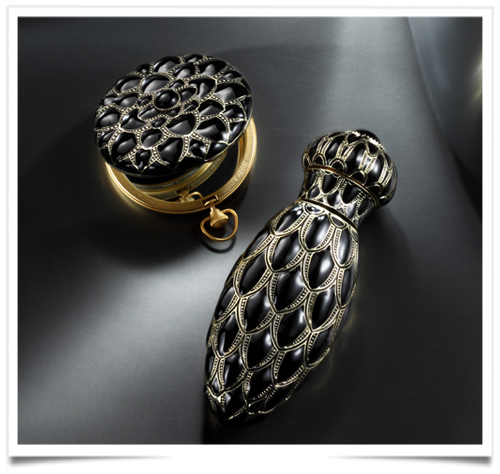 Caron, pays tribute to these elegances, and dedicates its latest collection of precious bottles designed and created exclusively by On Aura Tout Vu, the bottle adorned with a glossy black enamel, finished with a tin alloy of gold and silver tones, travelling from the past toward the future as a unique creation that engraved in the heart of Caron’s Haute Parfumerie identity. Formed in harmony, perfect balance between yesterday and tomorrow, just like Isadora, a fatal weapon of seduction. This entry was posted in BREAKING MODE, BREAKING NEWS, PERFUMES, pfw by admin. Bookmark the permalink.